TURKEY - Textile finishing machinery company HAS Group’s chief marketing officer Bahadir Kupeli has shared updates with T.EVO on industry innovations, sustainable production and the Turkish machinery sector. HAS Group, which serves the automotive, medical and functional technical textiles industries, has around a 15 per cent share of the textile finishing machines market in Turkey. “There are hundreds of dye-houses around our factories and this customer proximity is a strategic advantage for us. The proximity and demands from our domestic customers helped us to offer innovative finishing technologies. We export m to nearly 60 countries worldwide, including the USA, Italy, England, Poland, Portugal, Belgium, France, Switzerland as well as to strong textile manufacturing markets like Mexico, Uzbekistan, Bangladesh, Pakistan, Indonesia and India,” Kupeli commented. With much industry focus on ecological and sustainable production, as finishing machines for drying, fixation, etc. typically demonstrate high power consumption to maximise production output, machinery manufacturers must fullfill customer demands for quality and high output with the low energy consumption and minimised wasting of ressources, the company notes. HAS Group offers a heat recovery system, which, Kupeli says, it continuously improves to maximises energy saving. Currently, HAS Group’s 8 chamber Stenter is said to save up to 25 per cent energy. Looking forward, Kupeli predicts robotics and software for process automation will develop in the textiles industry, as well as new finishing effects on fabrics, will be a topic in every sector where humans are working. “Currently, most textile manufacturers are not recognising robotics and automation, but in the future, this mindset will be changed. I know some projects, for example a palletising system for yarns,” he added. 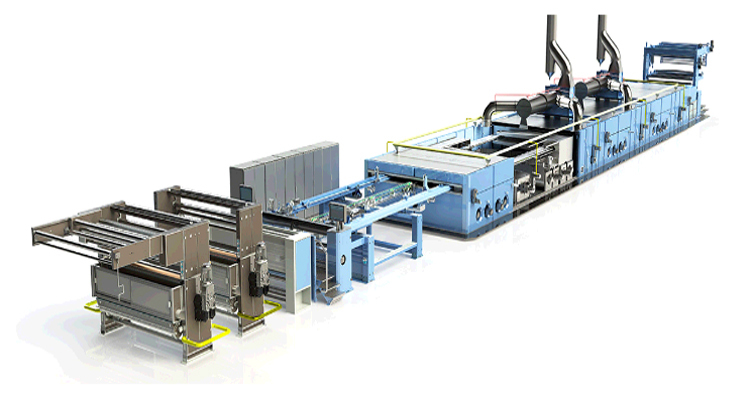 Image: Ram-X Series stenter machine from HAS Group.